With Google's stock price hovering near all-time highs, the risks to their business model have become a hot button topic among industry observers. The dramatic shift to mobile computing has the potential to upend every single company and industry. However, few seem to understand Google's business model well enough to gauge its risks. Let's take a look at some oft-repeated arguments and compare them to the real risks facing Google. 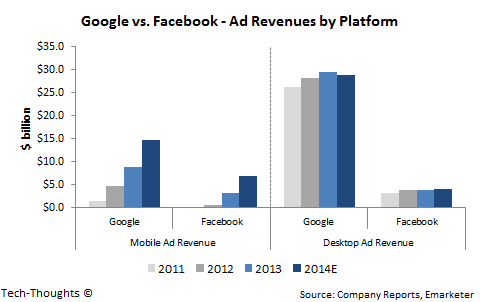 Let’s explore the three pillars of Google’s strategy that enable the company to sell more ads for more money. Google increases its reach by flattening any obstacle that stands between its ads and eyeballs. Then, Google expands its visibility to the user by providing services, creating more opportunities to show ads. Finally, the company squeezes the maximum out of those opportunities by mining user data, which allows them to understand and target users very efficiently. This pattern explains practically all of Google's initiatives, from Android to Google X projects to the Nest acquisition. Now, let's take a look at the frequent arguments against Google's business model and its real risks. One popular theory among industry observers is the threat of Android forking, i.e. a large technology firm could fork AOSP and replace Google services / APIs with their own. The point to understand here is that AOSP is not a threat to Google, but a cost of dominating the mobile landscape. It only becomes a threat if AOSP can be forked and combined with an ecosystem (services + app store) that is comparable to Google's. AOSP variants that exist today (Kindle Fire, Nokia X, Chinese builds) do not necessarily meet this criteria. Of course, forking Android may be beneficial to companies like Amazon and maybe even Microsoft if they play their cards right, but it doesn't really constitute a measurable threat to Google's business model. Very little overlap with popular Google services (search, maps, email). Of course, social is one of Google's weak points and they would love to get their hands on a messaging app. Leading messaging apps already have access to a massive, highly engaged user base, with strong network effects. Therefore, the incremental benefit from owning their own smartphone platform is likely to be minimal. This isn't necessarily true for businesses where user engagement isn't a given (e.g. : Amazon). Owning their own smartphone platform will not help messaging apps poach users from their direct competition -- Would a LINE or Whatsapp user buy a WeChat-only phone? Of course, this does not mean that messaging apps would never release a branded smartphone -- in fact, that may be a very effective channel to increase word-of-mouth and distribution reach. But they really have no motivation to fork AOSP. It's an unnecessarily complex process with little to no incremental benefit. One pattern commonly used to support these theories is that Google's revenue is highly correlated with the global internet population. The problem with that pattern is that it is almost entirely based on data from the personal computing era. Until mobile browsing reaches critical mass, we will have no knowledge of how this pattern will evolve. Therefore, assuming a flat ARPU isn't necessarily a good assumption when the underlying factors are no longer constant. This is especially true when we take into account the fact that Google has still not implemented any monetization strategies for mobile-focused services like Google Now. Google's business model will certainly force it to explore novel ways of monetizing these mobile services. Unfortunately, operating independent hardware companies will not be one of them. The chart at the top of this post shows the split of smartphone usage by task. Web browsing only forms 20% of smartphone usage while is mostly allocated to mobile apps. As I explained at earlier in this post, Google's business model is built on mining data on user activity. On smartphones, Google certainly has access to browsing and location data, but has no access to activity within apps. As of today, the only companies that have access to app usage data are -- 1) the app publishers themselves, and 2) Google's biggest competitor, Facebook. Facebook collects data through login / news feed integration with up to 200,000 apps. So far, Facebook has chosen to monetize this data using mobile app install ads, but there could be many other ways. As app usage continues to surge, search (even contextual search like Google Now) may become less relevant which could threaten Google's advertising revenue. Google's recent initiatives like Google Play Games aim to sync game data and achievements across devices. But the real goal of these initiatives is to gain access to currently closed user data (Games have the largest share of usage on smartphones). In addition to this, Google has also launched an initiative to crawl in-app content and deep-linking search results. At present, Google has relied on deals with individual developers to examine app content. The lack of a scalable option to index app content could certainly be a major risk to their business model.